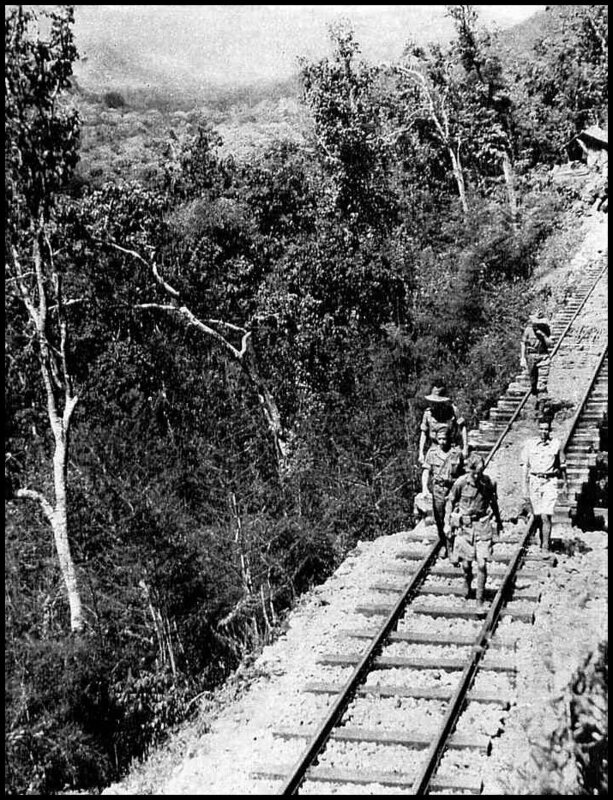 The notorious Burma-Siam railway, built by British, Australian, Dutch and American prisoners of war, was a Japanese project inspired by the need for improved communications to maintain the large Japanese Armv in Burma. During its construction more than 16 ,000 prisoners of war died - mainly of sickness, malnutrition and exhaustion - and were buried along the railway. Imprest Burmese and Malay labourers too died in their thousands - exactly how many will never be known. The Japanese kept no records and it was impossible for anyone else to do so, nor were the graves marked, but between 80,000 and 100,000 perished. The railway has been purchased by the Thai Government from its starting point at Ban Pong to the Burmese border, and it is now part of the Royal State railways. It is open to general traffic from Ban Pong to Kanchanaburi, about 33 miles.Japanese communications depended upon a long and exposed sea route to Rangoon via Singapore and the Strait of Malacca, and a road (quite unfit for prolonged heavy traffic) from Raheng through Kowkarelk to Moulmein. The decision to complete the railway connecting Moulmein with Bangkok, which had been commenced before the war but abandoned by the two countries concerned, was taken in June 1942. More than 250 miles of railway, from Thanbyuzayat in Burma to Ban Pong in Thailand, remained to be constructed, much of it through mountainous country and dense jungle, in a region with one of the worst climates in the world.The Japanese aimed at completing the railway in 14 months, or at least by the end of l943. They utilised a labour force composed of prisoners of war taken in the campaigns in South-East Asia and the Pacific, and coolies brought from Malaya and the Dutch East Indies or conscripted in Siam and Burma. From June 1942 onwards large groups of prisoners were transferred periodically to Thailand and Burma from Java, Sumatra and Borneo. Two forces, one based in Thailand and one in Burma, worked from opposite ends' of the line towards the centre.When the first of the prisoners arrived their initial task was the construction of camps at Kanchanaburi and Ban Pong in Thailand and Thanbyuzayat in Burma. Accommodation for the Japanese guards had to be built first, and at all the staging camps built subsequently along the railway this rule applied. The cook-house and huts for the working parties came next and accommodation for the sick last of all. Frequently men were sent to work on the line long before their accommodation was completed. Throughout the building of the railway, food supplies were irregular and totally inadequate. Brought up by barge on the Kwai Noi river, or by lorry on a road which was merely a converted jungle track, a consistent service could not be maintained by either method, and rations were nearly always below even the Japanese official scales. Vegetables and other perishables long in transit arrived rotten. The rice was of poor quality, frequently maggoty or in other ways contaminated, and fish, meat, oil, salt and sugar were on a minimum scale. Although it was often possible to supplement this diet by purchases from the local civilian population, men sometimes had to live for weeks on little more than a small daily ration of rice flavoured with salt. Red Cross parcels helped, but these were invariably held up by the Japanese. Malaria, dysentery and pellagra (a vitamin deficiency disease) attacked the prisoners, and the number of sick in the camps was always high. The Japanese demanded from each camp a certain percentage of its strength for working parties, irrespective of the number of sick, and to make up the required quota the Japanese camp commandants insisted on men totally unfit for work being driven out and sometimes carried out. 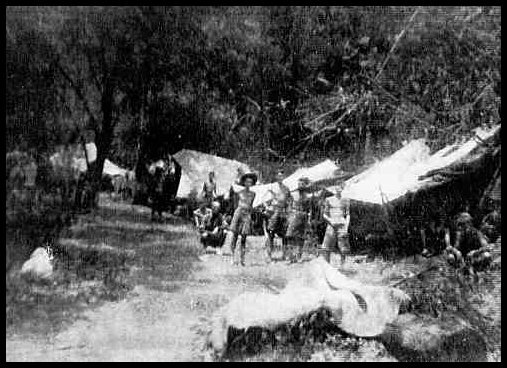 Those who stayed behind were accommodated in camp "hospitals" which were simply one or more crude jungle huts. At main camps such as Chungkai, Tamarkan, Non Pladuk and Thanbyuzayat were "base Hospitals" which were also huts of bamboo and thatch, staffed by such medical officers and orderlies as were allowed by the Japanese to care for the sick prisoners. To these base hospitals desperately sick men - the weak supported by the less weak, since no fit men were allowed to accompany them - were evacuated from the camp hospitals, travelling by the haphazard means of hitch-hiking on a passing lorry or river barge. At both camp and base hospitals, for the greater part of the time, the doctors had only such drugs and equipment as they had been able to carry with them. Neither drugs or surgical instruments were supplied by the Japanese, and although later on certain medical supplies were made available they were always inadequate. A great deal of equipment was improvised by the medical officers and orderlies, and food and medicines were clandestinely obtained. Only the devotion skill and enterprise of the prisoner of war medical staffs saved the lives of thousands and gradually evolved an organisation which could control disease and mortality. Work on the railway started at Thanbyuzayat on 1st October 1942 and somewhat later at Ban Pong. The two parties met at Nieke in November 1943, and the line - 263 miles long - was completed by December. Thereafter work on the railway consisted of maintenance, and repairs to damage caused by Allied bombing. Repeated reconnaissance flights over the Burma end of the railway started early in 1943, followed by bombings at intervals. These became more and more frequent when, towards the end of October 1943, trains full of Japanese troops and supplies began to go through from Thailand to Burma. The Japanese would not allow the prisoners to construct a symbol (a white triangle on a blue base) indicating the presence of a prisoner of war camp, and these raids added their quota to the deaths on the line. Most of the camps were right alongside the railway track and some were near bridges and other vulnerable points. The only cover for the prisoners was that afforded by the flimsy bamboo and thatch huts, where they were made to shelter while the raids were in progress, and the inevitable casualties were heavy. In one raid alone on the Non Pladuk area, where the camp was located amongst sidings holding petrol, ammunition and store trains protected by an anti-aircraft post, and prisoners were not allowed to leave the huts.95 were killed and 300 wounded. In March 1944, when the bulk of the prisoners were in the main camps at Chungkai, Tamarkan, Kanchanaburi, Tamuan, Non Pladuk and Nakom Paton, conditions temporarily improved. The Japanese had been surprised by the reaction of world opinion against their treatment of prisoners of war, and there is evidence that they began to feel apprehensive about the heavy casualties of 1943, and made efforts to counteract their reputation for uncivilised treatment of prisoners. But this phase soon passed and from May 1944 until the capitulation of Japan in August 1945 parties of prisoners were sent from the various base camps to work on railway maintenance, cut fuel for the locomotives, and handle stores at dumps along the line. Other parties were employed on cutting and building roads, some through virgin jungle, or in building defence positions. As before, their food and accommodation were minor considerations. The railway was overworked carrying troops and military supplies, and local traders seldom visited the camps of the working parties, small compared with those of 1943 and therefore not so profitable; so that supplementary food supplies were scanty, and again sickness took its toll. The only redeeming feature was the ease with which the sick could be evacuated to base hospitals in trains returning empty from Burma. The graves of those who died during the construction and maintenance of the Burma-Siam railway (except Americans, who were repatriated) have been transferred from the camp burial grounds and solitary sites along the railway into three war cemeteries. At Chungkai War Cemetery and Kanchanaburi War Cemetery in Thailand now rest those recovered from the southern part of the line, from Ban Pong to Nieke - about half its length. In the War Cemetery at Thanbyuzayat in Burma lie those from the northern half of the line. Those who have no known grave are commemorated by name on memorials elsewhere; the land forces on either the Rangoon Memorial or the Singapore Memorial and the naval casualties on memorials at the manning ports.